Iron Range National Park is the best national park in Cape York. If you only plan to visit one national park on your Cape York trip, make it Iron Range. 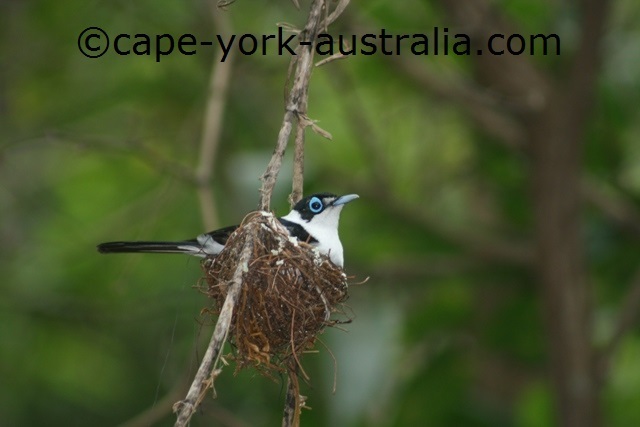 This is the only national park in Cape York that protects typical Cape York rainforests, contains so many of Cape York's unique plant, bird and animal species, and is accessible. 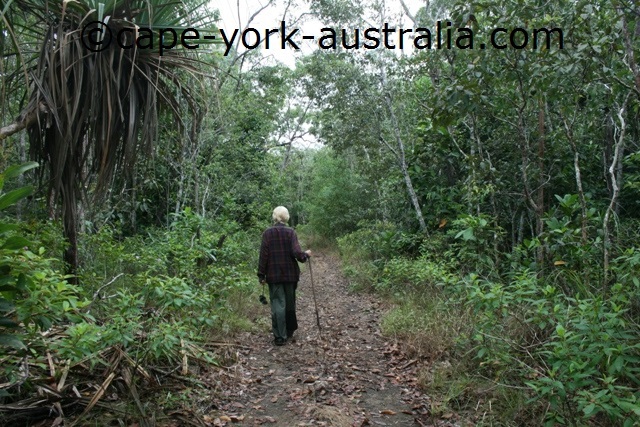 While there are pockets of other rainforests in Cape York, many of them are not very easily accessible. 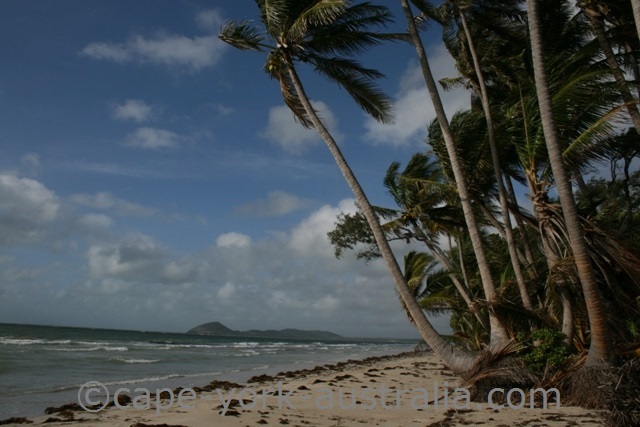 And while the rainforests of Daintree National Park just south of Cape York are at least as lush and extensive, it is not the typical Cape York rainforest. Daintree is a so-called Wet Tropics rainforest - it gets more rain, but it doesn't have most of Cape York's unique plants and animals. Iron Range NP is well known for its vegetation. Southern parts cover the largest area of lowland rainforest that remains in Australia. Many species are from the ancient Gondwana continent. Some examples are ant plants, and many others, including some carnivorous plants. Iron Range National Park is also one of the best places to see Cape York's unique animals that are found in PNG and not in the rest of Australia. Some of the best known ones are cuscus and green tree pythons. Both are best seen in darkness so bring a good spotlight. The most famous birds that Cape York only shares with New Guinea are eclectus parrots and palm cockatoos, and Iron Range National Park is one of the better places to see those, too. Other rare birds include red bellied pittas, Papuan frogmouths and frill necked monarchs. In the old days when parrot smuggling was a more common activity, a tree in the Iron Range National Park became known as Smugglers Tree. There were some parrot nests high up in that tree, and you can still see the spikes in its trunk that were used for climbing up to the nests. 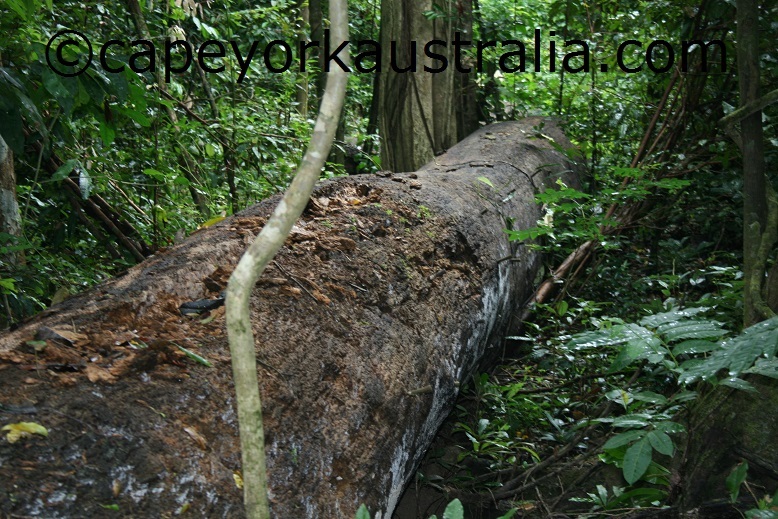 The tree was knocked down by a tropical cyclone many years ago. It is now laying on the ground but you can still visit it (sooner rather than later, it's rotting quickly like everything in rainforest) on one of the only two bushwalking tracks in Iron Range - the Old Coen Road Walking Track. 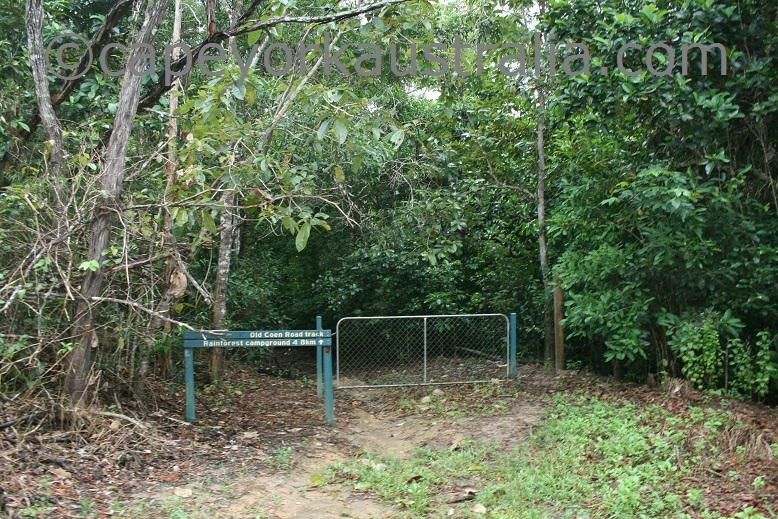 The 5km Old Coen Road Walking Track starts just south of the park entrance, and takes you past some rainforest creeks and through some dense rainforest. 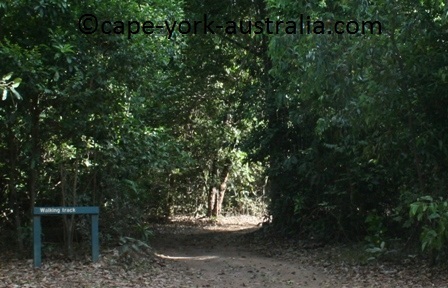 The park's only other bushwalk is a small track in the bush on Chili Beach. There are a few camping grounds in this national park. 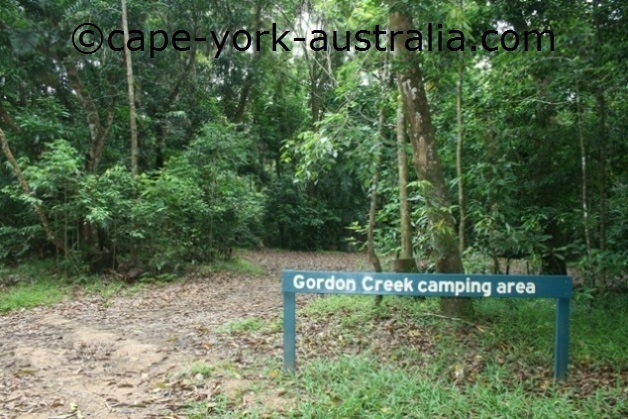 Along the main road, in the southern, main part of the park, are a few beautiful ones like the Rainforest Campground, Cooks Hut Camping Area, and Gordon Creek Camping Area. 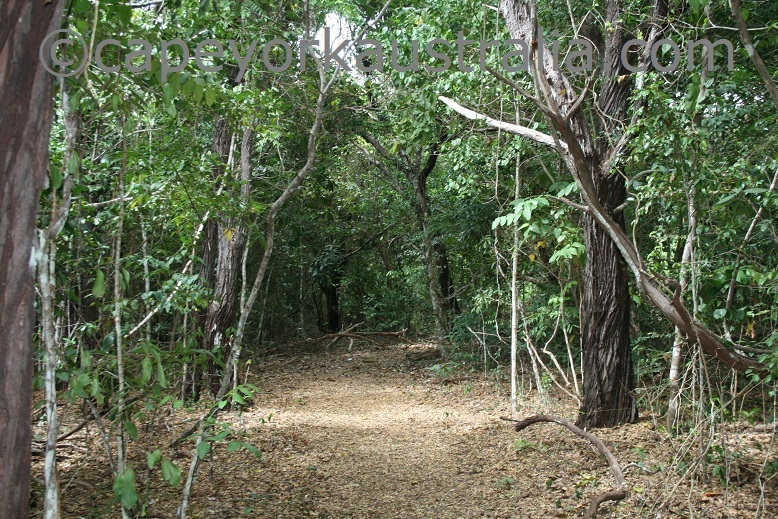 North of the main part of the national park, past the heathlands and open forests near Portland Roads, is another rainforest section at Chili Beach, which is also part of this national park. There is a nice large camping area, which is beautiful but can be windy. There are two walks in Iron Range National Park (Kutini-Payamu). 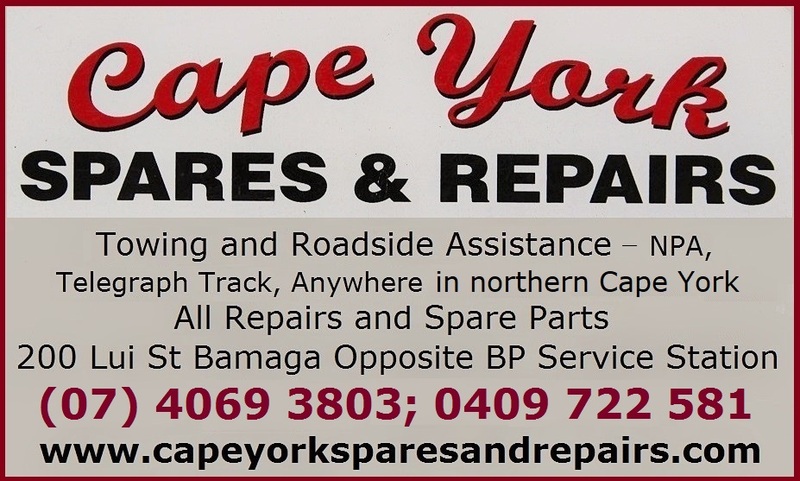 This is pretty good if you like walking, as a lot of other Cape York national parks this far north don't have much walking tracks. Most of the more serious ones are in the southern parts, and even south of the peninsula. 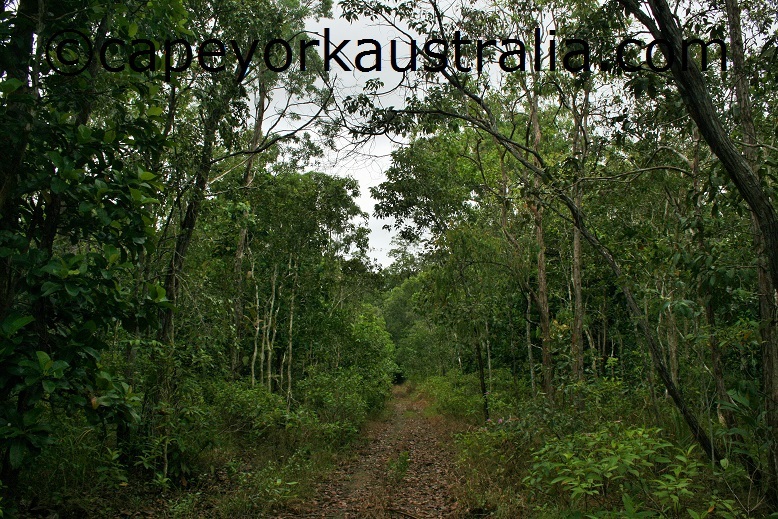 Iron Range bushwalks are not nearly as long and challening as some of the southern ones, but they are nice strolls through some beautiful rainforest and give you good chances to spot some of Cape York's unique wildlife.There is the shorter Chili Beach walk, and the longer Old Coen Road bush walking track. 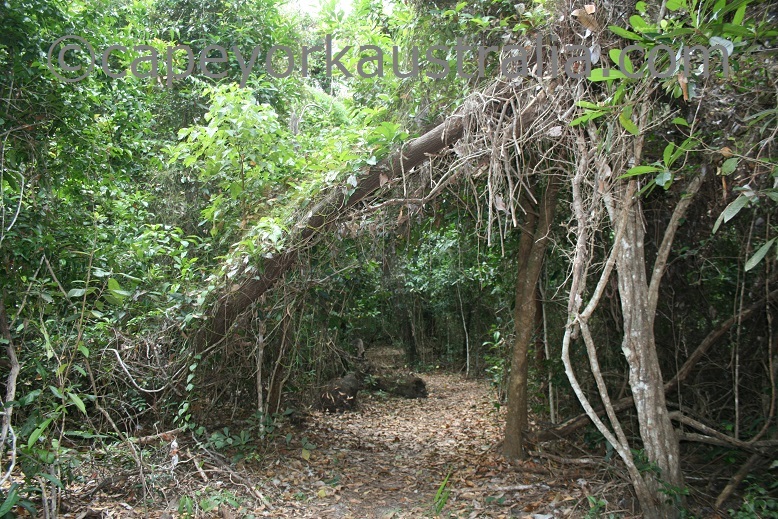 The first one is a small walking track in the bush on Chili Beach. Its one end is on your left hand side just as you drive in. And the other end is near the northern camping grounds. It is only a short track but mozzies can get quite bad so be better prepared than I was - with a mozzy spray. The other walk is longer and better. It goes through the main section of the national park, and is 5km one way. The Old Coen Road walking track. It is called the Old Coen Road Walking Track. Its northern end is at the Rainforest Campground. 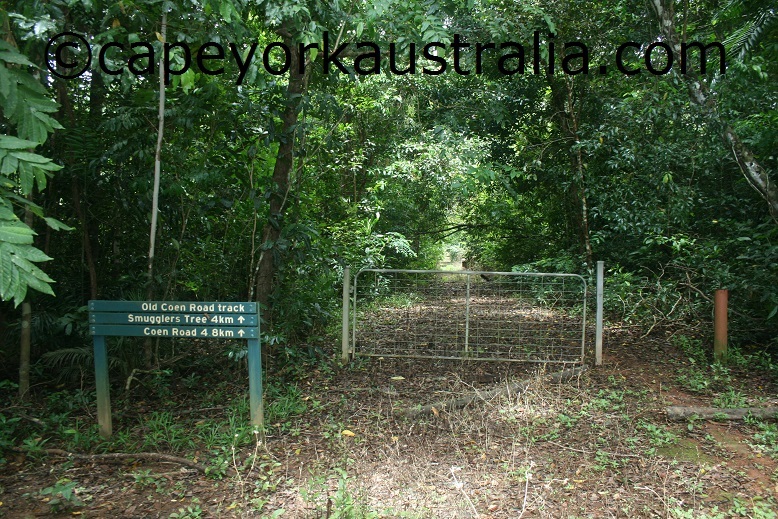 The Old Coen Road Bushwalk. It first crosses a creek and then goes through some dense tropical rainforest. 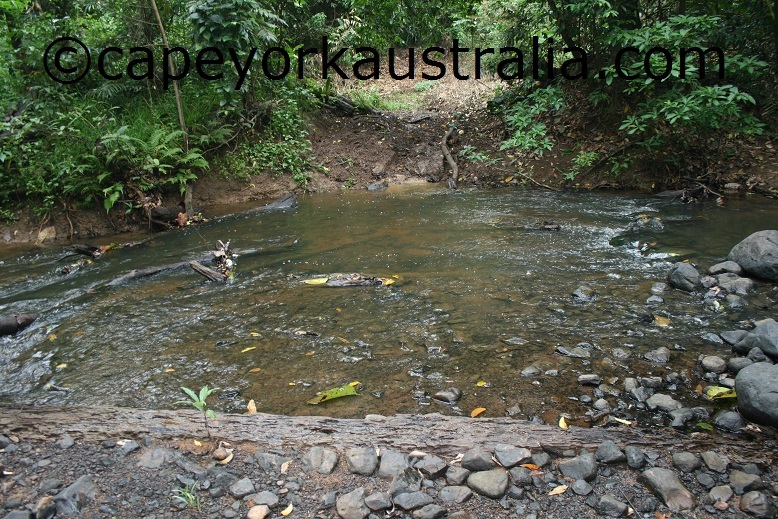 A creek on the Old Coen Road Bushwalk. Then it goes through some more open rainforest. The Old Coen Road walk. And then it comes to the highlight of the walk - the old famous Smugglers Tree. The end of the walk is south of the Iron Range national park entrance. The southern end of the Old Coen Road Bushwalk. 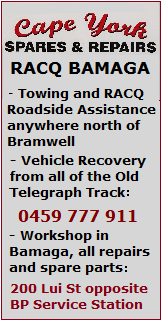 You can walk back along the road or maybe have someone to pick you up here if 10km is too long to walk. I was taken by Smugglers Tree before I ever saw it. Before I ever went to Iron Range National Park, I bought the book "Life in the Cape York Rainforest ". and I was really amazed about all the beautiful photos of Cape York birds, plantsanimals in that book, and more than anything I was taken by the story of Smugglers Tree. It is a simply presented but well written book by a reasearcher of Eclectus Parrots who worked in these rainforests, and because I have always had strong feelings against parrot smuggling, I never forgot the story. Then I went to Iron Range but I could not see the tree anywhere. 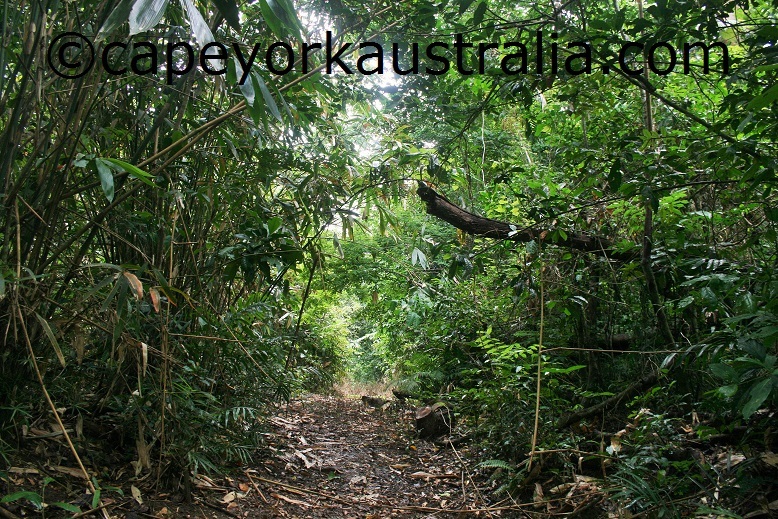 I stayed for weeks looking for Cape York's unique animals, driving around, spotlighting night time, bird watching day time.. until, the last day before I would leave, I realised I hadn't done the park's only long-ish bushwalking track. So the following morning I was walking along the track, and suddenly, just a bit off the track, I saw ... the tree! I could not believe my eyes. It wasn't "standing deep in the Iron Range rainforest" as stated in the book, "home to eclectus parrots and metallic starlings..."
It was laying down, half rotten and what I later found out, knocked down by a tropical cyclone. But the spikes were there. The same spikes that I saw on the photos in the book, the spikes that were used for getting up to parrot nests to steal the eggs and babies.. As described in the book, they only emerge half way out, as the tree has grown out around the spikes. Smugglers Tree in Iron Range National Park. I was just standing there and thinking back to the book, leaving my walking partner totally forgotten and by now looking for me... it was so amazing to come by the Smugglers Tree when I least expected. You can find the tree near the southern end of the Old Coen Walking Track, which starts just south of the park entrance (there is a sign - of the track - not the tree - on the main road). 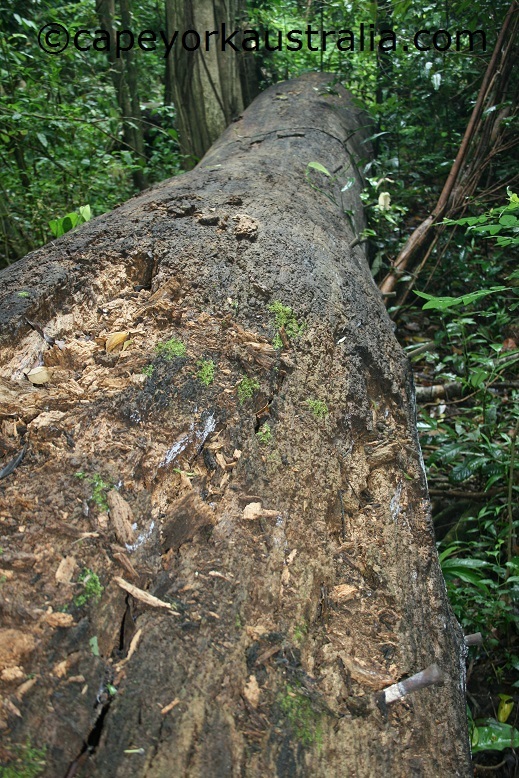 But because decomposing is quick in tropical rainforests, it's only matter of time before the only place to have a look at the tree is in the book, Life in the Cape York Rainforest .